This inscrutable, elusive entity is rarely seen. Its habits remain unknown, but it appears to be nocturnal and lurks in dark and remote places, such as underground caverns, thick forests and deep under the ocean. It hovers silently, seemingly dampening noise within its vicinity. 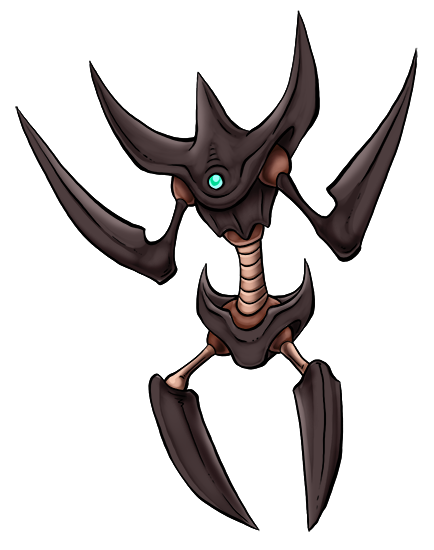 It is armed with a devastating array of razor sharp appendages which can slash an opponent to pieces in the blink of an eye; the cuts it inflicts are so fine that it doesn't even leave a ragged edge. Its blades can even slice through the very fabric of time and space, enabling it to seemingly blip out of existence and reappear elsewhere. A great addition to the archive ! !